This Coleman Portable Blender looks like a cool gift idea and will allow him to take the party with him; tailgate parties, camping, outdoor events, out by the pool, and more. This blender comes with 12V DC and 120V AC chargers so he can charge it wherever he is; and it makes a pitcher of frozen drinks in about 30 seconds with 20-30 cycles per battery charge. 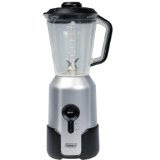 This Coleman Portable Blender features a cool electroplated finish with a black nonskid base.